The Parker Pen Company began producing the highly popular Duofold line of Pens and Pencils in the early 1920s. Initially, they came in red and black hard rubber. When Parker switched over to celluloid in 1926, the first color that they added was a Jade (green). However, this color line did not have the Duofold logo until some time in 1927. 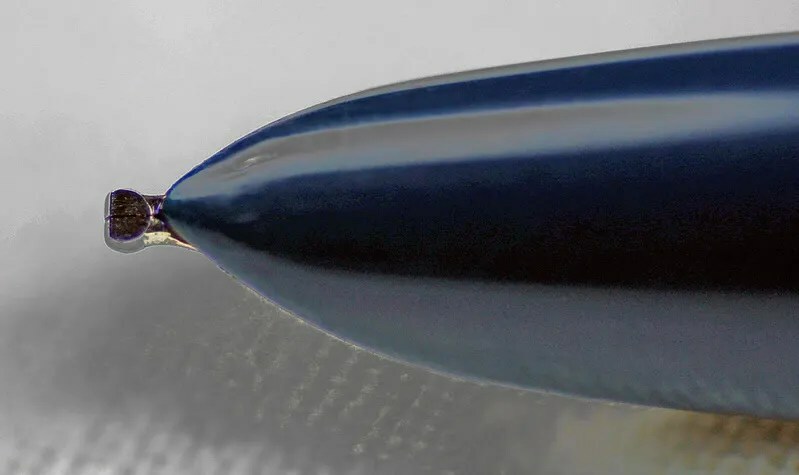 As discussed in previous posts, Parker Lapis Junior Fountain Pen and Janesville, Wisconsin Button Fill further colors were added as well as the Duofold line evolved. I would encourage you to read these posts for additional information. 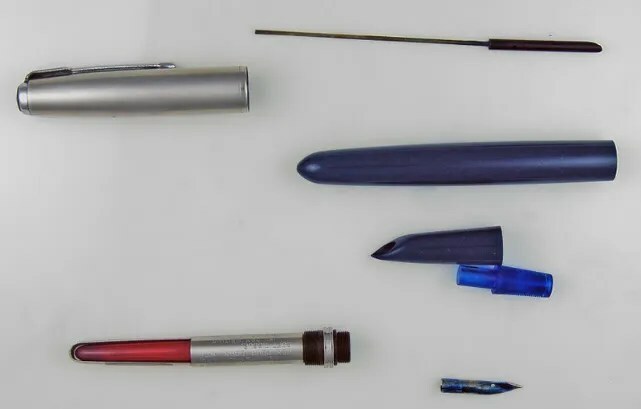 Here is a picture of this Pen (a Junior Size) after it has been taken apart. It is vey difficult to find these pens in perfect color. They do exist, but are priced at a premium. This pen is in better color condition than many, but certainly not pristine. The gold is quite shiny and my thought is that someone polished this pen before putting it up for sale, without restoring the internals. As you can see, the nib is a Lucky Curve imprint, consistent with this time period (1926). In order to restore this pen I needed to polish the nib gently. 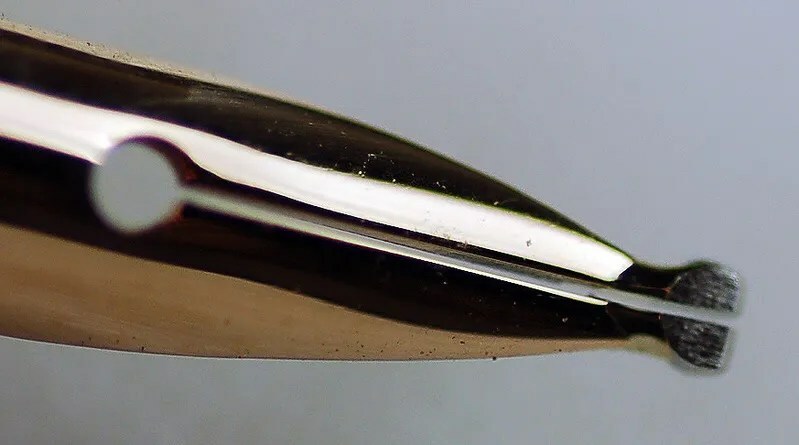 There was a little bit of staining where the nib sat in the section that came off with gentle polishing using a small amount of polish and a q-tip. I also polished the clip and cap ban gently. The same was done to the button and pressure bar. I am able to reuse the original pressure bar, so the only new part of this pen will be the sac. The feed and section were cleaned with water and a cloth and a new size 16 sac was attached to the assemble section/feed/ nib with sac cement. You must trim the sac with an xacto knife so that it fits in the barrel and when attached to the section it extends to just under the top of the barrel hole. After the sac was dry, I coated it with a light coat of pure talc and screwed it back into the barrel. I then carefully inserted the pressure bar into the pen through the top hole of the barrel so that the bar seated (remember to smooth the end of the bar a bit) on the section. The button is then attached to the bar and when depressed, should push inwards, collapsing the sac. I always test this with water and if the assembly is well done, a steady stream of water should shoot out after the sac fills. If this does not occur, you can unscrew the section again (after taking the bar out through the top) to make sure that the pressure bar has not compromised the sac at the section. Sometimes a sharp bar might cut the sac. Also make sure that the bar has not twisted the sac when inserted. A light shone in through the top of the barrel should show the top of the sac near the top of the barrel. Here is a picture of the Jade pen (c 1926) with a nice medium Luck Curve nib, ready to write. I like to put either black or vintage green inks in these pens. I have also shown the imprint of this pen below. Note that there is no mention of Duofold yet. When we think of Paris, we think of France, not Chicago. But the restored pen this week brings us to the “Windy City”. This pen was a fun one to restore as it is so colorful and very well preserved red hard rubber. As you can see from the photo below this is a lever filler that has not been used in quite some time as evidenced by the fractured and hardened sac. Standard cleaning was done. The section, feed and nib were scrubbed with q-tips and finished up with an ultrasonic cleaner. The cap was swabbed out and had the usual caked on ink residue. The threads on the barrel were especially dirty and a toothbrush did the trick on these. A size 16 sac was attached to the section with sac cement and the pen was reassembled. So now I am really confused. Merkle broom was in Paris, Illinois and The Paris Pen Company was in Chicago. 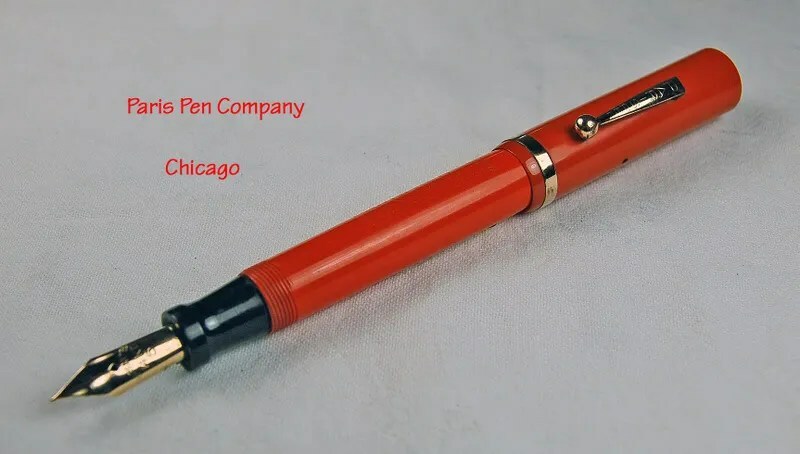 As I attempted to research the Paris Pen Company, I corresponded with a renowned expert in (Chicago) Pen History, who had actually worked in the Railway Exchange Building in the 1970s. He feels that the pen dates from around 1928 and that the Paris Pen Company may have been a pen store located in the Exchange Building, and that C.E. Barrett had probably made the pens for them. This seems to make the most sense, but the Paris, IL location makes me wonder how Merkle was involved with Paris Pen. I will continue to research this and will update the post in the future if more information comes in. As you can see below, the pen cleaned up well and is ready to write. The nib is a Warranted 14K No. 5. It is approximately the size of a Duofold Junior. A nice example of a red hard rubber pen, with an interesting and mysterious history. If anyone else has an example of one of these I would love to receive a comment from you.